An intense nose with that characteristic wild herb aroma note shares the stage with smoke and dusty earth surrounding blackberry fruit. A classic Carmenere. More black fruit and savory herbs on the medium-to-full bodied palate. A wine with some intensity and complexity it is quite juicy up front and but shows a rustic aspect developing an astringent finish with sandy tannins and some wood notes. I wouldn’t recommend it for the smooth and sweet crowd but if you like personality and some toughness in your wine this will satisfy. Just a really fun wine from Concha Y Toro, the very large South American producer that makes everything from bottom shelf sippers to the age-worthy Don Melchor Cab. Some funky earth and characteristic, Carmenere wild herbs compliment the dark berries on the nose, which also shows vanilla from prominent oak. There is obvious wood on the medium-bodied palate as well with firm, grippy tannins, finishing with a compelling mineral seam. The hint of sweetness up front doesn’t detract from the structure and the inherent rustic overtones of Carmenere which set this apart from other supermarket wines. An interesting wine for the price. As is typical with Carménère, the nose is peculiar but interesting—reticent red berry, subdued by minty, herbal notes and a bit of coffee in the background. A soft, simple, medium-body palate with a glycerin-like texture doesn’t offend but it gives way to harsh bitter herbs on the finish with strong apparent alcohol. Tannins are subdued but the finish is nevertheless too grim. Were it not for the finish this would be a pleasant wine. If you are the kind of drinker who pays no attention after the beverage goes down the hatch, this wine’s for you. But for $5, what do you expect? I am a fan of unusual wines, especially when they are inexpensive. With the hundreds if not thousands of wines available on any city block, 1/2 of them tasting so much alike, it is cause for celebration when you find something strikingly different. On that score Carmenere almost always delivers. Although originally a Bordeaux varietal, it is now seldom grown in France due to its susceptibility to disease. But it has found a home in the drier, geographically protected, valleys of Chile. 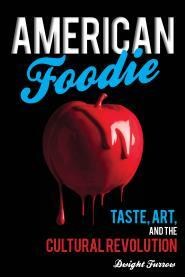 And it usually produces a wild and unpredictable tasting experience, sort of like meeting Charlie Sheen for dinner. This Carmenere plays to type. The fruit is almost prune-like, very ripe and dark for Carmenere but wild herbal notes, marjoram and mint, bushwack the senses, with coffee and fresh earth playing more subdued background music. The palate has an oily texture with some viscosity, very full body for Carmenere, with some sugar apparent. But the ample acidity and bitter herbal flavors on the finish balance that richness and give it hints of rusticity. Tannins are soft and the finish relatively short. Easy drinking but interesting, it seems a bit manufactured on the palate perhaps with added sugar to boost viscosity but the wild and wonderful flavors make this a real treat at this price. The hint of sweetness will make this a good barbecue wine or serve it with meat sauces that have a bit of sweetness to them like a mole. I’m on a Carmenere binge. There are worse fetishes aren’t there? 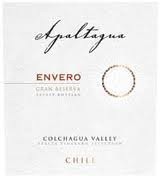 Last week I noted the Apaltagua Carmenere had its characteristic wild herbal notes tamed until the bitter finish reminded me of what I was drinking. This week’s Carmenere, also from Colchagua, is even more thoroughly house-trained. The Chileans really are trying to make this grape presentable. No feral vegetables and only muted bitter notes on the finish. 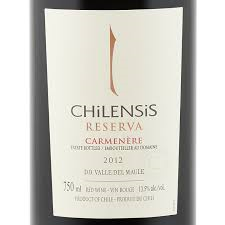 No wonder for many years the Chileans thought Carmenere was Merlot. This new breed of Carmenere is bringing out the Merlot-like character of the grape. 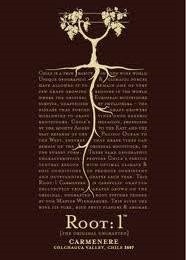 Black cherry, smoke, and black pepper are prominent aromas on the nose; chocolate completes the flavor profile on the round, shapely, medium body palate. 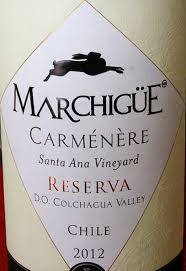 The finish is peppery and longer than is characteristic of Carmenere due to more substantial tannins than is typical. 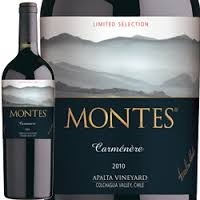 Montes makes the iconic Purple Angel, a high end ($60) Carmenere that takes the comparison with new world Merlot even further, with a big body and ample cigar box fumes due to the 18 months in new French oak. The Limited Selection, with only 70% of the juice 6 months in French Oak, lacks the depth and dimension of the Purple Angel but at $16 still has a touch of elegance and nuance. A good bargain. But I am missing that never-know-what-you-will-get quality of traditional Carmenere. This wine appears to be acquiring a conscience because the wildness has been tamed and what is left is almost respectable–a wine with aspirations. Carmenere is an odd grape. A former Bordeaux varietal although today seldom grown in France, it has found a home in Chile where the warm, dry growing season helps the vines to consistently flower and therefore produce reliable yields. Although Chile produces more Cabernet than Carmenere the latter has become a kind of signature grape for them. On the nose, red fruits settle nicely into a vanilla bath. Well-tamed green olive notes round out the intriguing nose. On the medium body palate, the fruit becomes dark and foreboding while still wrapped in vanilla. As you savor the mid-palate, the herbaceous quality becomes quite pronounced and then the bitterness hits and your remember this is Carmenere—it was going to take you on a wild ride at some point. If you like the way a mouthful of Kale finishes, this is your wine. Actually, I’m exaggerating a bit. The wine is overall a pleasant experience. Good acidity and the characteristic soft tannins keep this wine in balance. The flavors are deep and mouth-filling, and with a nice, fatty burger to absorb some of the bitterness on the finish this will satisfy. You owe it to yourself to take a walk on the wild side and this is one of the better Carmeneres available. A good bargain. 14% Alc.